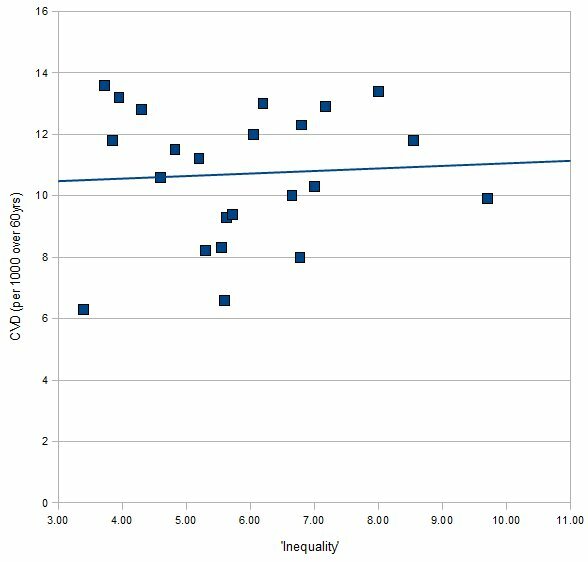 "...since the only plausible mechanism is through stress and CVD, what W & P really need to show is a correlation between inequality and CVD incidence. This, they never do." What he's saying is that as Wilkinson & Pickett (W&P) in the Spirit Delusion are claiming that income inequality influences health via the biological effects of psychological stress, and as the evidence from research on individuals suggests that any relationship between inequality or stress and health are likely to be through effects on cardiovascular disease (CVD), you would expect them to demonstrate that differences in inequality between countries are in fact associated with cardiovascular mortality specifically (rather than mortality overall). Well W&P may not do that, but I thought it was worth looking at. I obtained 2004 mortality data from the WHO. Obviously this data is confounded by the relative population structure so I took data for the over 60s since this is an at risk group for CVD and less likely to be confounded than the 15-59 age group. 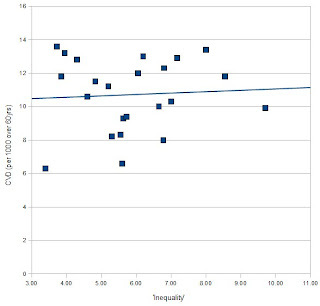 I'll just look at the countries W&P include in their analyses and use their measure of inequality. The measure of cardiovascular disease I'll use is ischaemic heart disease and cerebrovascular disease deaths (per 1000 over 60s) combined. Not very convincing. That's a minimal correlation of r=.06 (not remotely statistically significant). If we just look at ischaemic heart disease (r=-.012) or cerebrovascular disease (r=.119) alone these are also small correlations and not statistically significant. I'm obviously still concerned about differences in the age structure in the over 60 populations between these countries but using other cause mortality as a covariate (which might pick up some of these population differences) doesn't make the relationship any stronger (doing a similar analysis using 15-59yr olds we find a correlation of r=.107 which is only marginally improved by using other cause mortality as a covariate, and which remains not even remotely statistically significant).